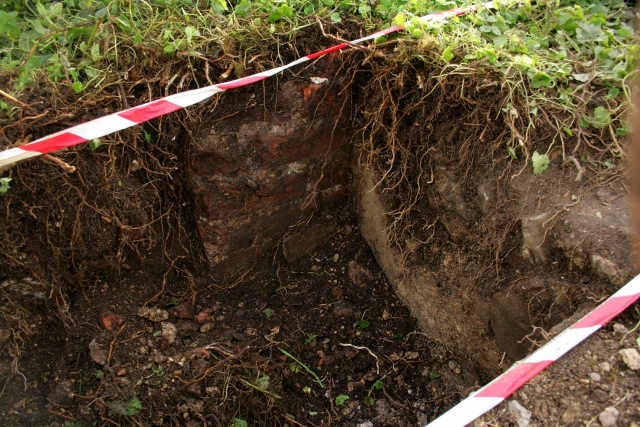 Discovery of the Newmarket Farm Cottage fireplace. 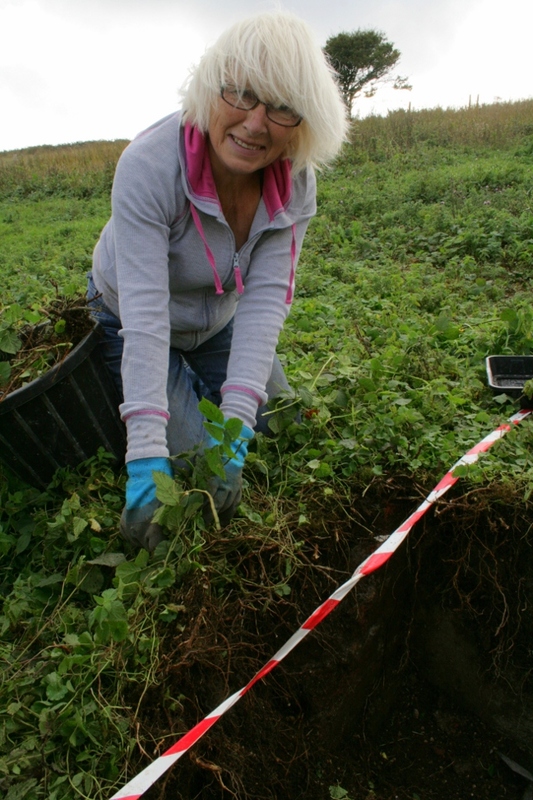 A really good day – despite the wet start; new finds, new features and new survey control points! Simon of SeSurveying.co.uk came over with some fancy kit to enable us to get our site properly surveyed. Four control points were fixed in place, and can now be used to locally survey as well as to geo-locate all our finds and features. The close proximity of the tv/radio/mobile aerial did cause problems though. He will be returning sometime soon to finish the survey. Then, as soon as our dig is finished and is nicely cleaned up, SeSurveying has promised to sponsor us with a free high resolution laser-scan of our excavation which can be used as the basis for a digital reconstruction of the cottage. Looking N from site of fireplace on E wall of cottage at concrete platform and ‘woodstore’ beyond. 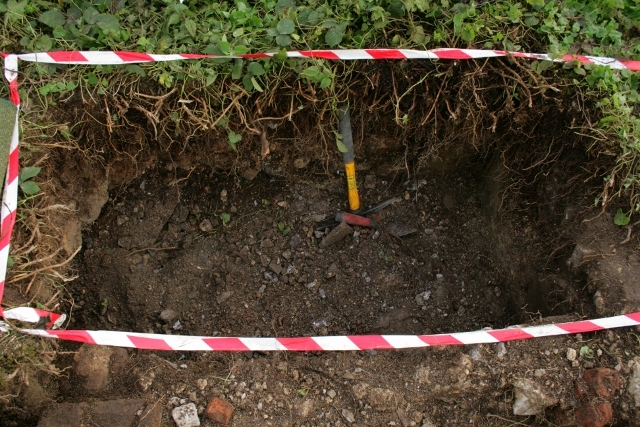 A 2m x 0.5m extension to the south of last week’s 2x2m grid square (which included the concrete platform which may have been the foundations for a laundry copper?) 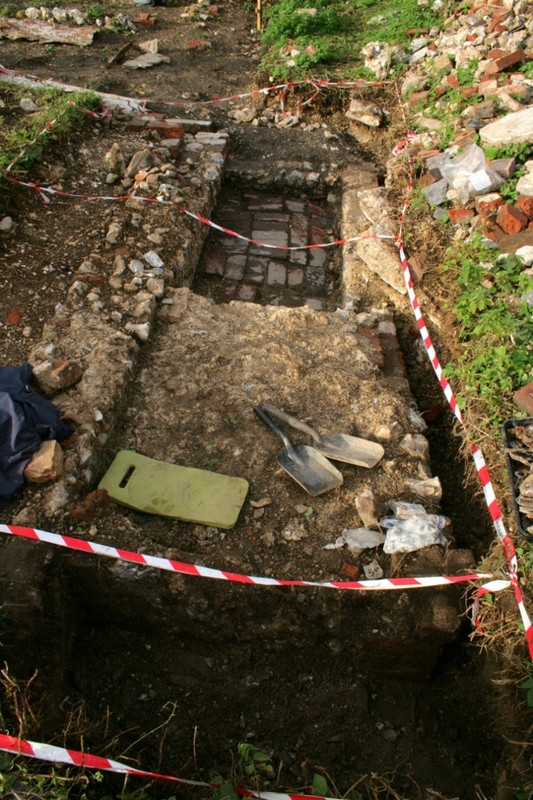 was excavated, located across the east wall of the cottage, just the other side of the dividing wall between the 19th century wash-house and kitchen (which became the 20th century kitchen and living room). It was slow work digging down through the brambles, nettles and demolition rubble. 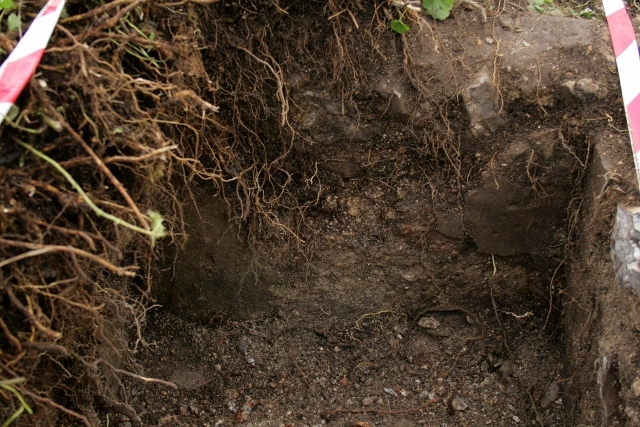 There still remains another 10cm or more to be excavated in our 40cm deep trench. Looking SW from concrete platform at plastered east cottage wall and projecting base of chimney. An unexpected, but really exciting discovery, at the very edge of the trench just over 50cm further down the side of the house we found about 5 courses of the brick footings of the (probable) chimney, projecting a brick and a half out from the wall. This would have surrounded the open fire on which all the 19th century cooking may well have been done. Looking W at partially plaster rendered section of E cottage wall sheltered between the two projecting features. The east wall of the cottage between these two projecting features possessed a partially intact plaster rendering. A large number of such plaster fragments have been found in the demolition rubble across the north and east sides of the cottage. This is the first exterior in situ render found. This suggests that at least some parts of the flint and brick built house were probably white-washed. 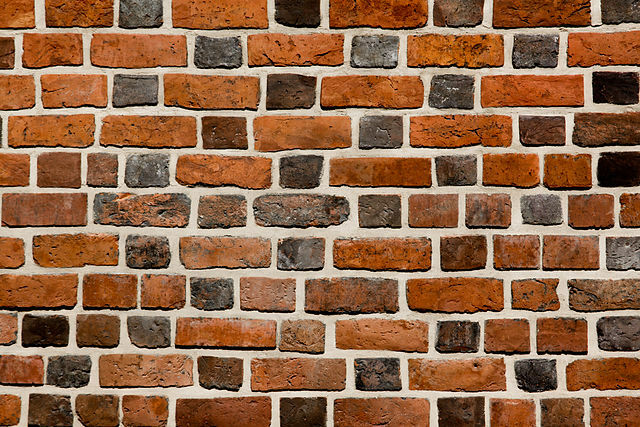 A wall constructed in glazed-headed Flemish bond with bricks of various shades and lengths; from Wikipedia. Nevertheless, a small proportion of the bricks in the demolition rubble had glazed header ends, as well as being of a range sizes and colours, such as is illustrated above. They were especially found in the demolition rubble to the north and north-east of the house. This suggests the front of the cottage may have included a mixture of flint and decorative brickwork. and in the very bottom of the trench – just one very small area excavated down to the original ground surface – a single sculptured rim shard of pale blue and white ceramic, and a single shard of bottle glass – suggesting there are more domestic glass and ceramics to be found when we (hopefully) finish the trench on Sunday. Our return to the south of the house in search of the east wall of the ‘sort of lean-to conservatory’, and another possibility of a well will have to wait till next week – Sunday our new priority is to finish excavating the newly discovered fireplace. We would love you to join us – no experience required! We meet at the car park near the junction of Bexhill Road and Falmer Road, just north of Woodingdean, at 10am, and if the weather is too bad to dig we are still happy to give a quick tour for anyone interested. Also, our official guided tour of the site is on Saturday 2nd November, same time and place as above.